In August 27th 1994, a group of Ndigbo gathered in Houston, Texas to presumably express purpose of exploring the establishment of a credible and unified voice for Ndigbo outside Nigeria. This union was formed when a tyrannical dictator in the person of General Sani Abacha rose against the people of Igbo by trying to review the National Constitution in favour of his people (Hausa/Fulani). 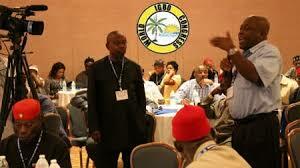 "The World Igbo Congress is a combined Biafran clans representatives under one umbrella. The sole aim of this union is to stand in the gap created by the British-Nigerian government to suppress and subjugate the people of Igbo. Outside the so called-southeast which is part of Biafra, other ethnic nationalities in Nigeria regards anyone that comes from Biafra land (i.e. southeast and south-south) as an Igbo man. Meanwhile Igbo is a tribal language of a particular clan in Biafra land. But when they come to Biafra land, they will tell those they refer to as an Igbo man (i.e. Biafrans from other clans who resides in diaspora may be within Nigeria or abroad) not to associate himself with an Igbo man from the Igbo speaking part of Biafra. Here comes the name Niger Delta, south-east and south-south. This has been the key to their divide and rule tactics which they have been using to extract God given resources deposited in Biafra land. They have used this means to create enmity between brothers while making merry with the proceeds of the mineral deposits at the same time destroying the land in all the areas the oil is deposited. The world Igbo Congress was formed in other to destroy all this impressions. They were formed in other to unite the people of Biafra together as brothers and sisters. They were formed in other to put their voices together and speak in one voice for the interest of their people. This is a group of educated men and women that would have been considered as elites of Biafran people but it’s very unfortunate on how the mighty has fallen. This set of people deviated from their earlier intentions for establishing the organization to having fun and merriment as well as competing among themselves on who will be the richest and fattest as political ambitions become the order of the day. The World Igbo Congress has every potentiality to position the plight of the people they represent in the frontline of every agenda of humanity but the reverse is the case. It is said that a man with a vision is on a mission. It is so sad that the body of World Igbo Congress deviated from their vision thereby missing their mission simply put they are visionless. As an organization that has missed her vision, their mission becomes impossible. Despite the visitation and call for awakening from slumber of WIC by the prophet of our time Mazi Nnamdi Kanu the leader of Indigenous People of Biafra https://youtu.be/4fPQOPEH-0Y the organization of World Igbo Congress (WIC) are yet to wake up. They are all watching like moronic idiots and they are clueless more than Muhammadu Buhari. As confused as Adesina. Very pathetic that the World Igbo Congress just sat and watched Nnamdi Kanu the very man that warned them ahead of time for preparation of what is happening now, languishing in Kuje prison on the order of Muhammadu Buhari. World Igbo Congress sat and watched their youths being murdered in cold blood by murderous security agents on the order of Muhammadu Buhari the president of the zoo called Nigeria with impunity. On the 20th January 2017, Biafrans who rallied in support of Donald J. Trump presidential inauguration ceremony in Igweocha (porthacourt) were killed in their numbers just because they are Biafrans https://youtu.be/jxXYiNSliY8 over 20 Biafrans were killed, more than 200 were arrested and accused of treason and till today, they remained in different prison custody across Nigeria, majority of them are still languishing in Nigeria prison cells in different locations while uncountable number of persons that sustained different degree of injuries are in different hospitals across Biafra land. On the same day, another group of people who are anti-Donald J. Trump sponsored by the president of Nigeria protested against the president elect of the United States of America, Donald J Trump in the western part of Nigeria(Lagos) https://youtu.be/wrobGwn0DC4 without any body raising a stone on them instead they were guided by the same Nigeria murderous agents in military uniform. Oh my goodness me! What have we done to deserve such a passionate hatred from Nigerian gov't and even WIC. I am yet to know the mystery behind the existence of the people of Biafra that made the whole universe to have such large hatred on us. Why do everyone wish us death? While we are the most peaceful and loving set of people on earth. World Igbo Congress watched as the murderous Fulani herdsmen invaded the land of Biafra and do whatever that pleased them with our crops, women and our youths. who among the rich is willing to make the sacrifice? What is the essence of riches? Of what usefulness is popularity? Of what usefulness is education? Nnamdi Kanu has opened the door for all to enter but it's a pity that many prefer merriment to the door of salvation and freedom. I am happy Asari Docubor Edi-Abili of Kalabari kingdom has now decleared to the whole world that he is on the way to the salvation house. It is now up to all the people within Ibibio, Anag, Kalabari etc to decide the God they will serve. Behold the man whom many of you are looking up to has joined the status quo. It is not too late to join this IPOB moving train now but always remember that this open door will not forever remain open. I know too well that the likes of Mbaka and the rest shall latter retrace their steps and lick their vomits. If the miscreant in Ota farm can latter speak with both sides of his mouth, who are others not to do the same. Ndigbo social-political organizations in the United States such as WIC, IWA, State, LGA, and other cultural associations are useless and laughable. The people involved in those organizations and associations are seldom selfish, egoistic, greedy, envious, hateful, competitive, and myopic. They do not have any single plan for Ndigbo but selfish interests and personal agenda. I detest them all. I thank God each day for IPOB. With their leadership, focus and determination, Biafra will be actualized.